Major international lens companies – along with many innovative smaller suppliers – are gearing up for Optrafair London, which will run from 11-13 April, at Kensington Olympia. The unrivalled opportunity to see the benefits of upgrading patients to premium lens options, and utilising specialist dispensing aids to maximise the advances made – particularly in bespoke free-form options – is a vital business opportunity. “Differentiating your practice by providing the very best lenses available and ensuring that patients know the merits of office/computer lens options; enhancing driving vision and reducing glare at night; customising the lenses to lifestyles and by being bold about promoting the very best that is available, is the future. Come to Optrafair and see what is available for you to take back home to your patients,” urged Optrafair Chairman, Malcolm Polley. Caledonian, Carl Zeiss Vision, Essilor, Hoya, Jai Kudo, Lenstec, Nikon, Norville, Omega Led, Ridgeway Optical, Rodenstock, Scotlens, Shamir, Specs Network with Seiko, Vision-Ease and Waterside are all now organising their product launches and promotional news for the April show. For Caledonian Optical, the Rx house, Optrafair London is a chance to promote surfacing, glazing and manufacture of freeform lenses and the growing safety lens sector. Promoting the benefits of lens technology to patients through digital demonstration tools – many using tablet devices – is a major feature with a choice from several providers. “We bring to the market the best quality lens materials, the most advanced lens designs and the most innovative treatments: all suited to the most demanding consumers and trade partners in the optical field,” said Dale Hughes, Hoya Lens UK Marketing Manager. “As many as 73% of European presbyopes have a different prescription for their left and right eye. Even the smallest prescription difference will lead to a visual imbalance that can cause asthenopic complaints. Hoyalux iD MyStyle V+ is the first progressive lens in the world to take this difference into account, as it balances the design performance between right and left utilising binocular harmonization technology,” added Dale. Nikon Optical will be showing its latest support materials, advertising and iPad demonstrations, along with launching the new premium progressive – Nikon Master. 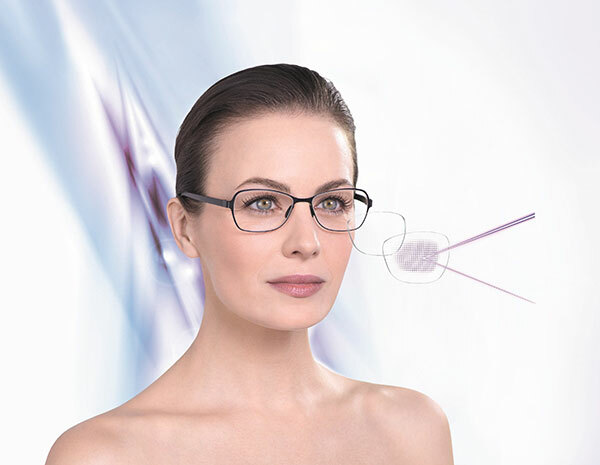 “Optrafair London is the ideal opportunity to show the product’s performance and ease of adaptation. Nikon Master benefits from ground breaking surface optimisation technologies thanks to the Nikon Optical Design Engine (NODE). The third generation aberration filter and ease of fitting make this product a “must” for any discerning dispensing professional to have in their armoury,” said Martin Thompson, Managing Director, Nikon Optical UK. Jai Kudo is keen to highlight its honeycomb mesh which offers a “pin-hole effect, reducing diffused reflection, making vision sharper and clearer and vastly reducing eye fatigue. Designed to only allow primary rays to pass, it reduces chromatic aberration and provides clearer views, and is ideal for computer use, reading, night driving and working in artificial light,” said Rob Harnett, Sales and Customer Services Manager. Jai Kudo will also be promoting its Wideview range and Blue Shield treatment, developed specifically to block ‘blue-light’ rays that emanate from many devices, such as LCD televisions, smart phones, tablets, GPS screens, and pc monitors, causing eye-fatigue. Essilor believes Optrafair London “adds a new dynamic to the market” and is looking forward to welcoming opticians from all over the UK to their stand. “In addition to the lens designs we want to communicate the success of our Centre of Excellence in Thornbury, which offers a local service on our premium digital lens products,” said Mike Kirkley, Managing Director, Essilor UK. Essilor will be promoting its latest innovative lenses, including top of the range Varilux S, and Varilux E series – a new launch which gives more wearers access to Varilux performance, whilst reducing swim control. “We will also be featuring the latest in our Crizal portfolio, Crizal Prevencia, which prevents premature ageing by selectively filtering out harmful blue light. It preserves overall well-being by allowing essential visible light to pass through, including the good blue turquoise which regulates sleep and wake patterns, cognitive behaviour, and mood,” added Mike. “We pride ourselves on our product portfolio and we’ve worked hard to establish a reputation for high quality products.We offer all the leading brands including Nikon, Carl Zeiss Vision, Kodak and Transitions along with our own brand products. We are especially proud to be selected partners and approved glazing laboratories for Essilor, Seiko Optical, and Shamir, plus glazing of all rimless mounts, 8 Base Sports brands for Nike, Oakley, Police, Rayban and many more,” said Managing Director, Nigel Castle.